The problem with dramatising Alice’s Adventures in Wonderland is the episodic structure of Carroll’s book. 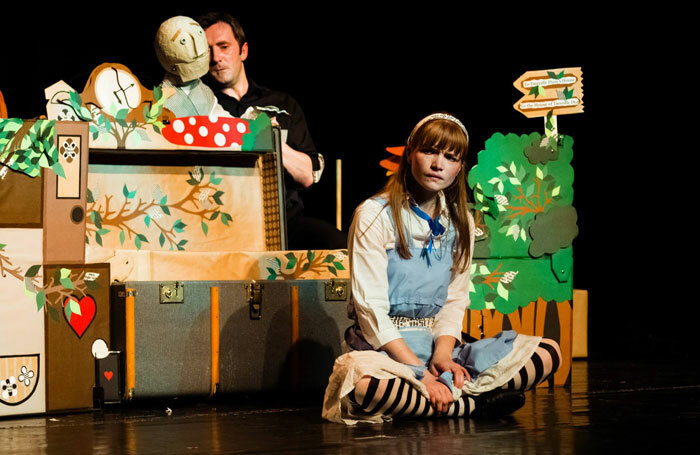 This puppetry-dependent version, which is loaded with charm and attractively imaginative ideas, gets around that, and, inside an hour, finds both rhythm and coherence – and that’s unusual in any take on Alice. This Alice has two identically dressed personae: Antonia Christophers and a 3ft-high puppet. In both guises, Christophers finds exactly the right assertive and inquisitive manner. Noel Byrne plays or puppets most other roles. His talking flowers, Tweedles Dum and Dee and pair of playing cards are particularly entertaining – especially when he emerges from the playing cards as the imperious and ridiculous Queen of Hearts. The fine, wide ranging voice work for Carroll’s colourful cast of characters, from both actors, is one of the best things in the show. The ingenious set consists of fold-down miniature flats with flaps and engaging surprises, such as the sides of the clock becoming the outside of the Cheshire Cat’s face. There’s playful fun with props, too, including the flamingo croquet mallets and table where Alice finds her “drink me” potions.